When Nicholas Hytner and Nick Starr started looking at homes for their new theatre company they were, inevitably, drawn to the West End. Theatre’s powerhouse double act – known variously in the industry as ‘Nick and Nick’ or ‘the two Nicks’ – were about to leave a golden period running the National Theatre and already knew what was next. They just didn’t know where. 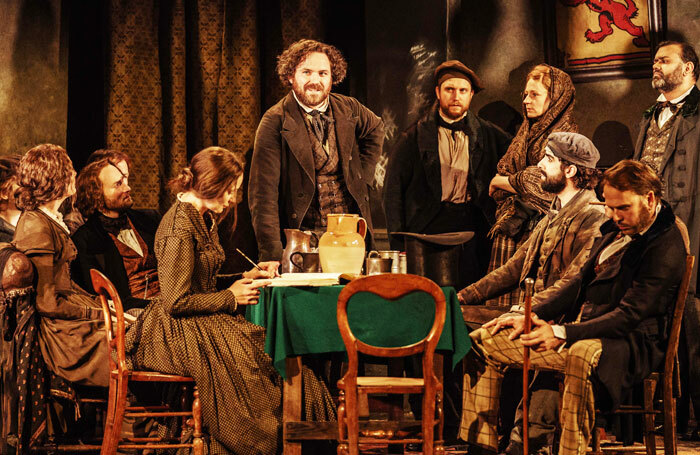 The ‘eureka moment’ came when they turned to each other and asked: “Why does theatre have to happen in the West End?” Instead they looked east. A spot nestled between Tower Bridge and City Hall, with a view of the Tower of London, was where their gaze finally alighted. 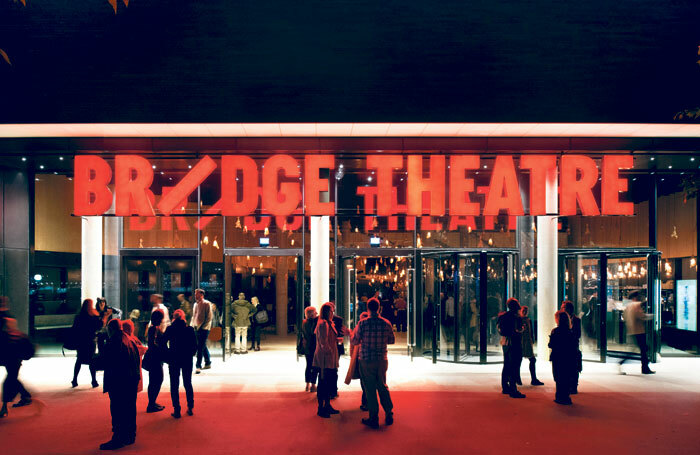 Several years on, the Bridge Theatre, the first large-scale commercial theatre in London to be built outside the West End, opens tonight with Richard Bean and Clive Coleman’s play Young Marx, starring Rory Kinnear. There has been a population shift in London, with more than half the city’s inhabitants living east of Tower Bridge, and the new theatre is a stone’s throw from the tube, train and bus hub at London Bridge station. Added to that, theatre attendance numbers in the capital have grown by 24% since the turn of century, according to the Society of London Theatre box-office figures. The London Theatre Company was incorporated in June 2014 according to Companies House, two months before Starr left his post as the National’s executive director. Hytner, the theatre’s artistic director, departed the following April. They left an impressive legacy at the organisation, with former chairman John Makinson saying they had led the theatre to “undreamed levels of creative and commercial success”. This included trebling the NT’s annual income to £117.7 million 12 years after they joined. Among their triumphs was a sponsorship deal with Travelex that brought in cheap tickets and packed out the auditoriums. They masterminded broadcasting theatre into cinemas with NT Live, and sent blockbuster shows including War Horse, The History Boys, One Man, Two Guvnors and The Curious Incident of the Dog in the Night-Time into the West End and beyond. Hytner left after the completion of the £80 million transformation project of its South Bank home – NT Future. But the seed for the Nicks’ new venture had been planted three years earlier, when Starr suggested that their next project should be in the commercial theatre, not just as producers, but builders and owners as well. They wanted to set up on a commercial basis with much of the ethos that comes from the non-profit sector. “The mad thing to do would be to shift into a whole different mindset,” says Starr, who had spent all of his career in subsidised theatre. Hytner has more commercial experience, having worked on the original London and New York productions of Miss Saigon, but says he feels the same way. “We started imagining what it might be like to own a theatre in the West End,” Hytner says. There was one particular venue, he adds – though declines to name which – whose owners were interested in selling. They did “quite a lot of work” on ideas to turn the venue into the home for their new venture with theatre architect Steve Tompkins, of Haworth Tompkins, with whom they had worked on the Temporary Theatre, the red timber-clad structure that sat in front of the National between 2013 and 2016. Hytner and Starr quickly realised that few other buildings were for sale in Theatreland and most were restricted by their listed status. Hytner says it took them “a little while to break with the conventional wisdom that commercial theatre had to happen in the West End”. So they turned from existing theatres and started looking at different styles of buildings to convert or construct within. “We had been to all sorts of bonkers places,” Hytner says. “Really bonkers,” Starr agrees, though they give no clue as to where they went. If they were to look elsewhere, it had to be well served by public transport. They rejected an excellent site because the journey from the tube station was “probably the most unpleasant 15-minute walk” in London. “It was too big a risk,” Starr says. He adds with a wistful air that this riverside location – shrouded in secrecy – “will be brilliant in 20 years’ time”. 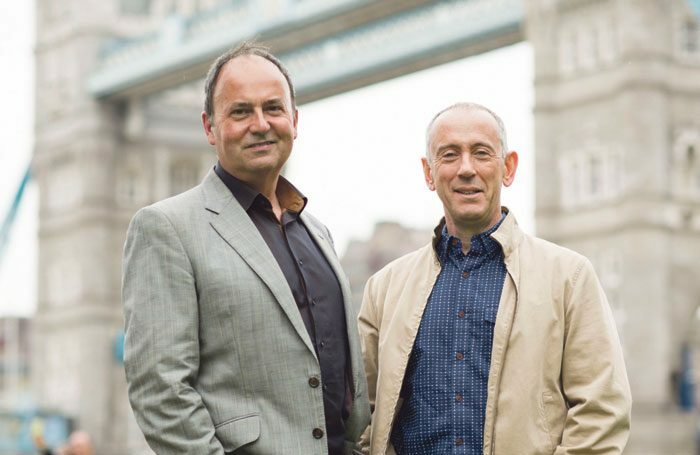 Hytner and Starr first looked at the Tower Bridge site just before Christmas 2014. “It is the most wonderful location,” Starr says. It has the added bonus of excellent transport links, being close to London Bridge station. The solution came about through discussions with Starr’s friend Robert Wolstenholme, managing director of real estate investment and development business Trilogy Property. They had been on the board of London’s Bush Theatre together and Wolstenholme asked how much space they needed. “There was a discipline,” Starr says. “Don’t take more than you need because you’re going to pay for it.” The Bridge has no rehearsal room or studio space. Wolstenholme was involved with Berkeley Homes on the One Tower Bridge residential scheme. “We have much to be grateful to him for,” Starr says. Built on the old Potters Field coach park, the development will create about 400 homes. Berkeley’s website is marketing the “five-star living experience by the banks of the Thames” of one, two and three-bedroom apartments at between £3.6 million and £6.2 million. Part of the condition that Southwark Council approved the development was the inclusion of a non-specific cultural site. Hytner and Starr pitched for the 6,873 sq metre facility, beating several competitors to win it. The Bridge has been described as the latest jewel in the “cultural string of pearls” along the South Bank, which includes Tower Bridge, Shakespeare’s Globe, Tate Modern and – of course – the National Theatre. With restaurants including the Ivy also taking up residency, Berkeley’s south-east managing director Harry Lewis has talked of his hopes the area will become the “Covent Garden of the South Bank”. The Bridge has its own high-end food offering, bringing in the restaurant St John to run its bar and cafe. As well as interval drinks, audiences can order warm interval madeleines. Nicholas Hytner: Everything I’ve seen I’ve really liked. You win some you lose some, that has always been the case. The wins have been pretty spectacular. Nick Starr: The balance of power has shifted so decisively towards the theatre owners, it has become harder for independent producers. NH: A handful of West End producers are doing a really good job. It’s really tricky to get hold of a West End theatre, since every show is a different venture that has to be capitalised on its own merits. NS: It’s fortunate we’re opening in east London. if we were opening in the West End it would be a much bigger deal. NH: So many really good stage actors, through film and television, have become people the wider public want to see. The days when there are a handful of movie stars people would pay West End prices to see are long gone. NH: We’re commissioning this stuff because it excites us – not because we’re committed to observing a programme of innovation imposed from outside. NH: The really interesting thing about dramatists these days is that their careers are so varied. Most write for theatre, long-form television and movies. 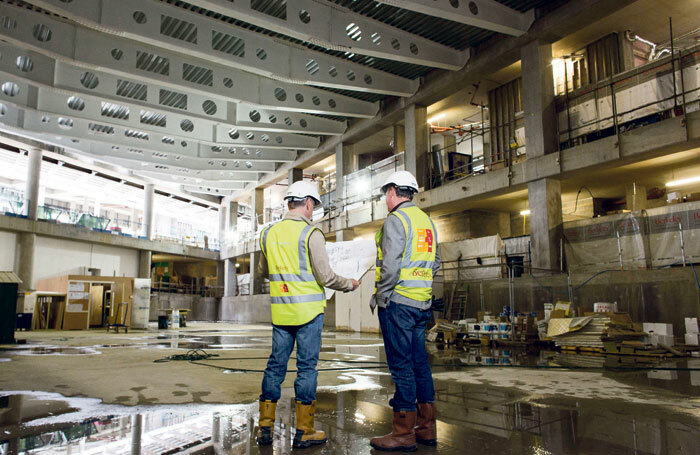 Tompkins, who had recently won the Riba Stirling Prize for the Everyman Theatre in Liverpool, had been trying to design the perfect auditorium with his colleague Roger Watts. It had not been specifically for the Tower Bridge space – in fact, Tompkins describes those early plans as an “intellectual R&D exercise”. 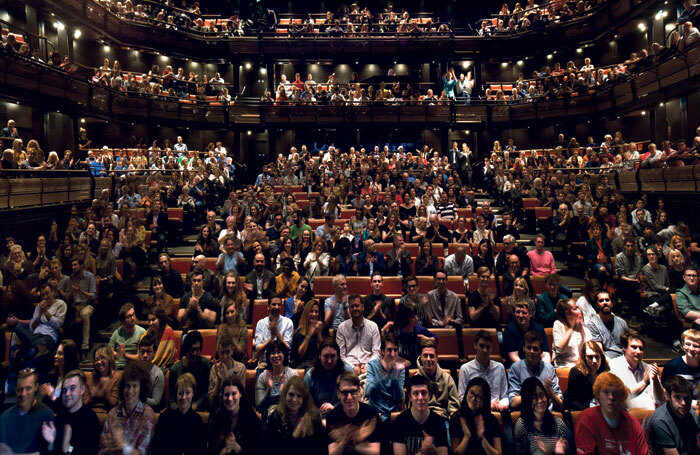 At about 900 seats – the exact number will change with the configuration for every show – the Bridge is close to double the size of the Young Vic, but the designers wanted it to remain “connected and intimate”. The architects looked at how theatres were moving away from deep Victorian and Edwardian tiers. “We looked at courtyard spaces and chamber opera houses where everybody is tapered around the walls in shallow galleries,” Tompkins says. Taking the utopian plans they had been working on, Tompkins and Watts began to hone the design, looking at sight lines and building computer models. With specialist US manufacturer Tait, they developed a modular system in an aircraft hanger in Thetford, Norfolk, where they could mock up the auditorium, sit in the seats and tackle any potential issues ahead of their arrival on the South Bank. The auditorium comes in 57 pieces, splitting into towers and seating galleries. It can be built in a factory and brought in on the back of a lorry. They are carried in on a monorail and a ‘Tonka truck’ fits it into place. Tompkins talks with pride of the flexibility of the auditorium. “We can change formats without a lot of technology involved,” he says. The first three productions will be in order: end on, promenade and then thrust stage. “They will really take the auditorium through its paces,” the architect says. All the money for the construction cost of £12 million, with fees on top, was raised up front. Hytner and Starr raised the money from a small group of investors on a venture-capital basis, as a start-up with growth potential. They did not seek institutional investment, but from wealthy individuals with family offices. According to the latest statement at Companies House, from June, this includes Travelex boss Lloyd Dorfman and City grandees Robin Geffen and Clive Sterling. After Young Marx, starring Kinnear and Nancy Carroll, follows a new production of Julius Caesar in promenade with Ben Whishaw, David Morrissey and Michelle Fairley. Hytner is directing both. 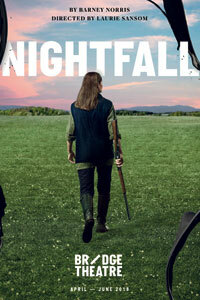 The third production, opening in April, is Nightfall, written by Barney Norris and directed by Laurie Sansom. But do not call these three plays a season. The Bridge is doing away with the notion, in favour of talking about new productions when they are ready. He adds: “It would be great to say Young Marx is a statement of intent. I hope it is. But it isn’t like kicking off your tenure at the National with Henry V.” Hytner will hope the Bridge’s debut receives the acclaim that his NT debut did in 2003, with Adrian Lester in the title role. Among those future projects are a new play by Lucinda Coxon, a dark comedy by Trainspotting screenwriter John Hodge and a new play about JS Bach. He adds that creative innovation in spoken theatre has “largely been contracted out to the subsidised theatre”, though he credits the work of producers including Robert Fox, Matthew Byam Shaw and Sonia Friedman. Despite not having to make grand statements of intent on a year-by-year basis, Hytner says in one way he is not as free as when programming the National’s schedule. Some observers have suggested the Bridge will lure audiences away from the National and Hytner’s successor Rufus Norris. He continues: “London appears to be surviving the surreal frivolity of our political leadership. Acting and writing are as strong as I’ve ever known them. But in 50 years of being aware of politics, I’ve never known such frivolous leadership. How long you have known Nick and Nick? Since they started at the National Theatre, some time around 2002, I think. What’s your background? I trained in technical and stage management at LAMDA, and started in stage management. I was production manager at English Touring Theatre and Oxford Stage Company before the National Theatre, where I was production manager and then technical producer. I was also technical producer on the build of the NT’s Temporary Theatre. How long you have known Nick and Nick? We met in May 2015, when I was trying to explore ways to start out as a producer after several years practising as a lawyer in the City. What started as a short-term project researching ticketing, customer relations and branding developed over the course of a couple of years into my current role. What’s your background? I spent several years after university as a director, mainly in opera, before retraining as a lawyer. I made the leap back to theatre in early 2015. How long have you known Nick and Nick? Since the summer of 2008, when I began what was meant to be a two-month project developing the idea of live broadcast into cinemas. It became NT Live. What’s your background? I trained as an actor in Chicago and then at Ecole Jacques Lecoq in Paris. 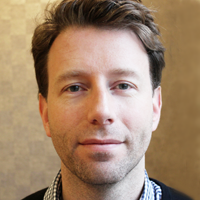 I was director of broadcast at the National Theatre from 2008 to 2015, where I launched NT Live, produced four broadcast documentaries, the National Theatre’s 50th-anniversary gala and was executive producer on the feature film adaptation of London Road. Training: English National Opera, 1978-80; rep in Exeter and Leeds. Editor's View: Could the Bridge broaden theatre’s horizons?